Get your teeth into this! 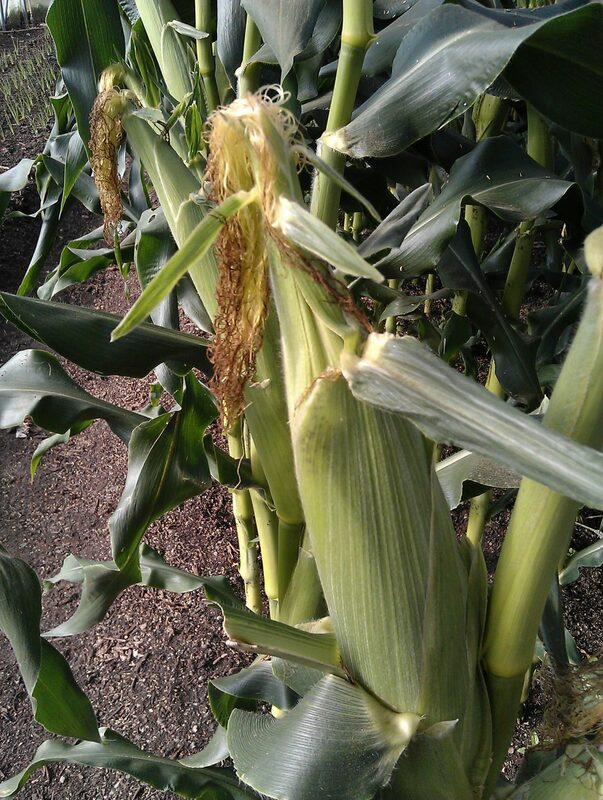 Our sweetcorn harvest has begun and we’re overwhelmed with sweet, flavoursome tomatoes, basil and rainbow chard. We all have an extra vegetable this week – a green or yellow pepper. If you can’t eat corn off the cob you could try cutting the kernels off the cob and putting them in this hearty soup. 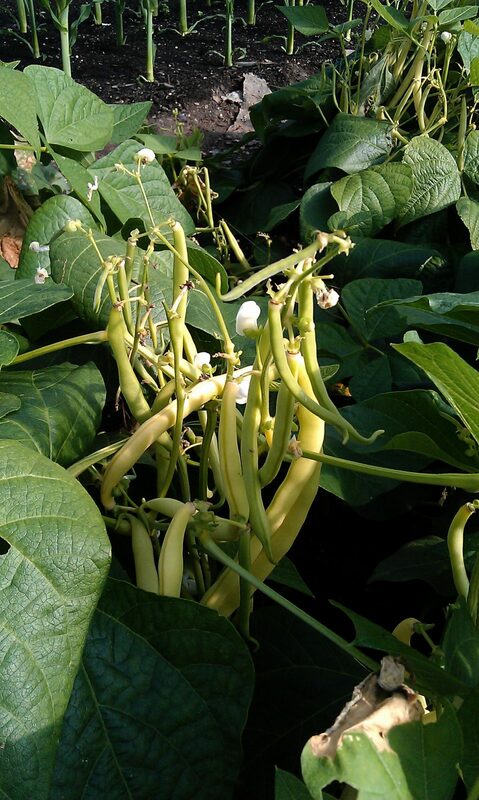 The recipe can be found in River Cottage Veg Every Day by Hugh Fearnley-Whittingstall. Heat the oil in a large saucepan over a medium heat. Add the onion and garlic and sauté gently for about 10 minutes. Add the paprika and 1 Tbsp of the oregano. Cook for another minute. If using dried beans, drain them after soaking and add to the pan, with the stock and bay leaf. Bring to the boil, then reduce the heat and simmer for about 45 minutes, or until the beans are completely tender (dried beans vary, and sometimes this may take over an hour). Add the squash, stir well and simmer for 10-15 minutes until the squash is just tender. If using tinned beans, add the drained, rinsed beans, the squash, bay leaf and stock at the same time, and simmer until the squash is just tender, 10-15 minutes. Then add the French beans and corn kernels and simmer for a further 5 minutes. To finish, season well with sea salt and freshly ground pepper. Stir in the remaining oregano, leave to settle for a couple of minutes, then serve. Our boxes are bursting with veg this week. 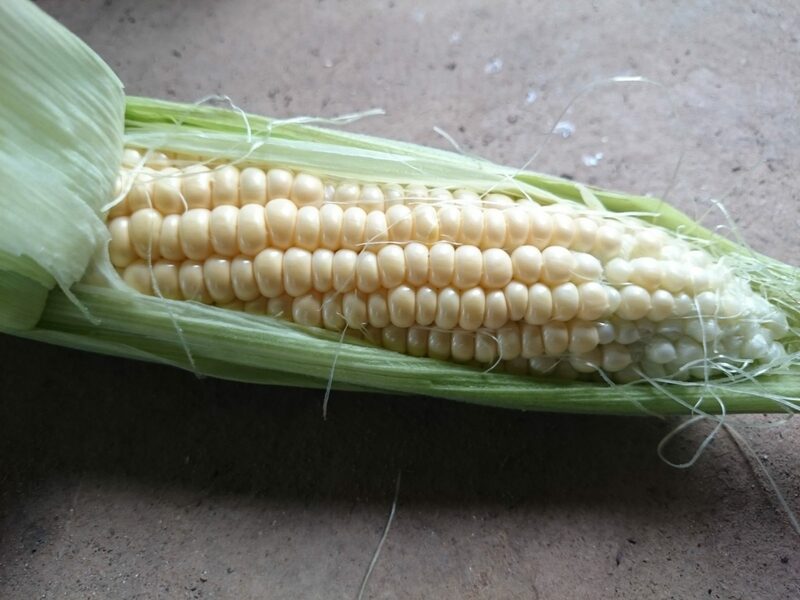 We’re enjoying the first of our bumper crop of juicy onions and sharing out 100 corn cobs produced by Mark Norman on his sunny smallholding near Bodmin. * = grown to organic principles. All produce grown by Camel CSA unless otherwise indicated. Please wash all vegetables and fruit. 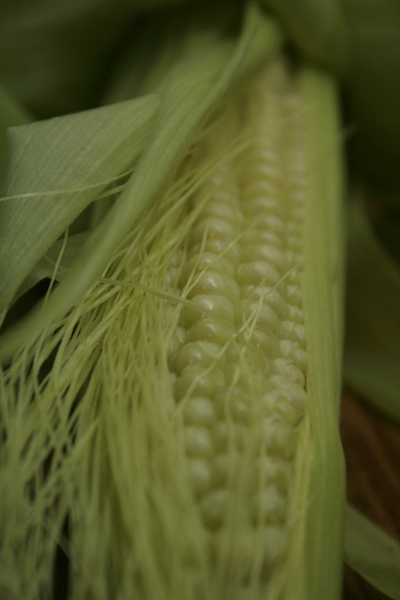 I like to eat freshly-picked sweetcorn with Cornish butter (preferably from Trewithen Dairy). When I’m not feeling so pure but want to keep it simple, I use this recipe from Riverford Organic Farms. The chillies are ripening in Camel CSA’s polytunnel. One will be enough in this dish, as they’re quite hot. Heat the butter and oil in a large pan. 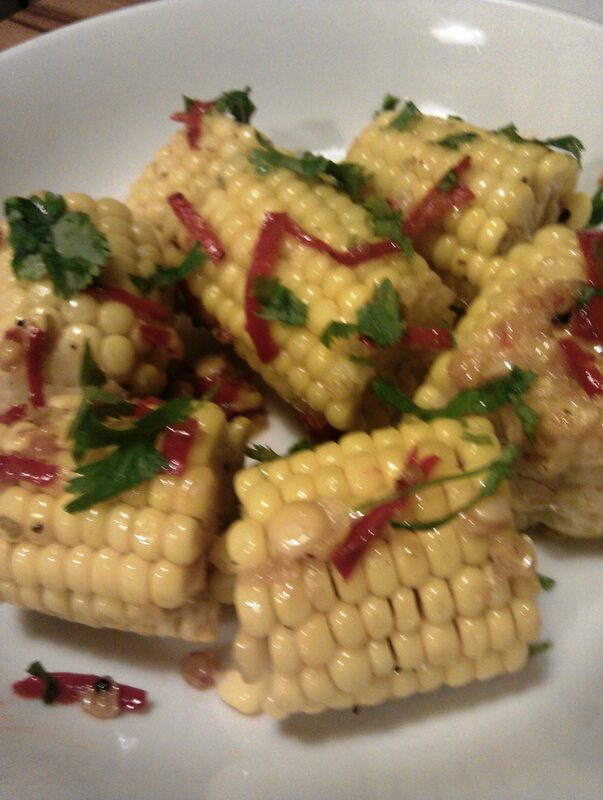 Add the sweetcorn, lemongrass and chilli. Stir for 2 mins. Add the lime zest and juice, with 4 tbsp water. 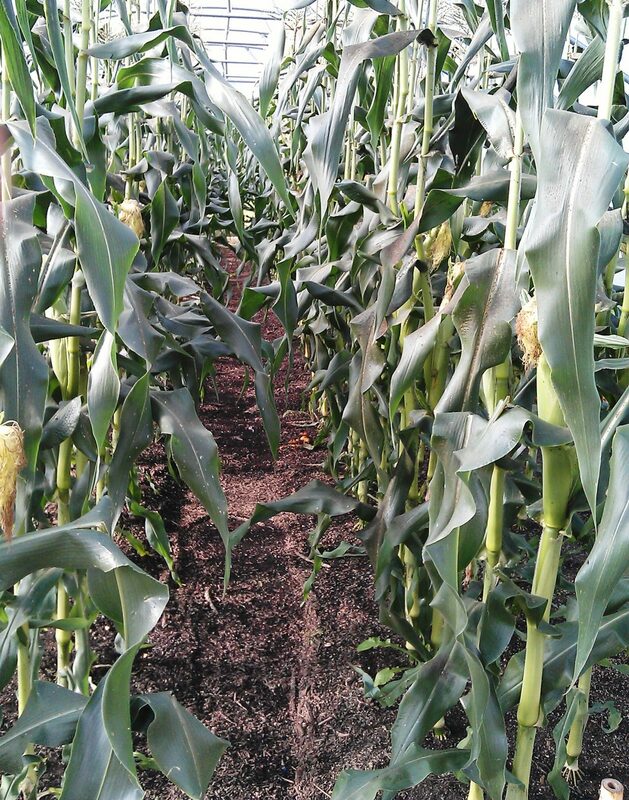 Cover and cook for 6-8 mins, stirring every now and then, until the corn is cooked. Keep an eye on the liquid and top up a little if needed. Season to taste and stir in the coriander to serve. 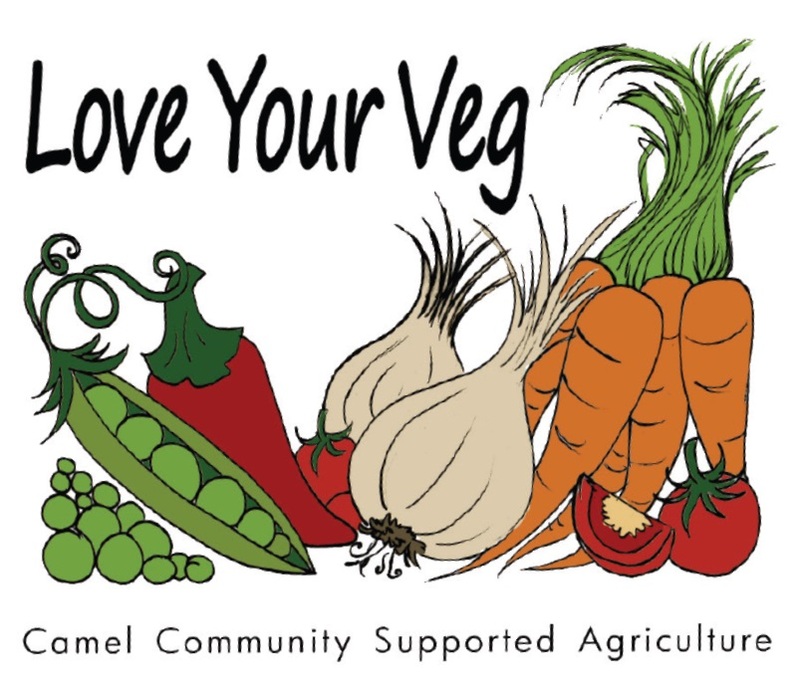 Camel CSA’s expert growers have been responding in lots of innovative ways to the difficult vegetable growing conditions this year in Cornwall. When the ground in May proved too wet and soggy to prepare any growing beds let alone plant anything, Bridget had a brainwave. 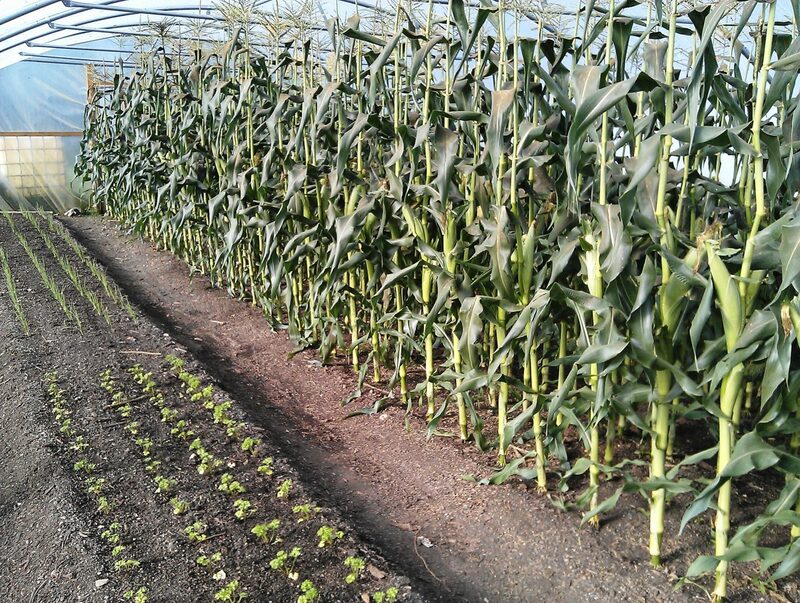 Why not put some sweetcorn in the polytunnel? And you can see the results for yourselves – what a success! The only drawback has been the blackfly, which means messy hands for the pickers. It’s been a productive end to the week on Camel CSA’s site at St Kew Highway in north Cornwall. 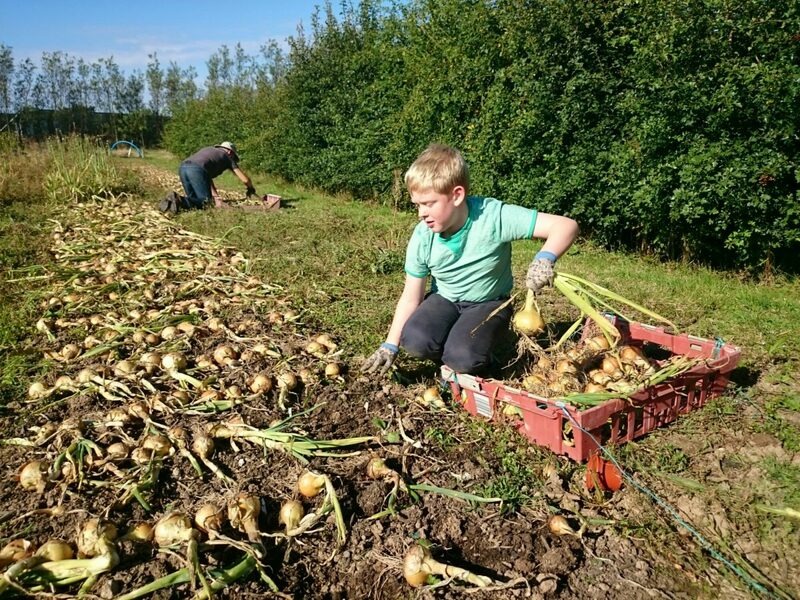 While the new polytunnel framework was being painstakingly put together, the volunteer picking and packing team were harvesting our own homegrown carrots, sweetcorn and beetroot from the veg plot. As the freshly-dug carrots are so muddy they all need to be washed before they can be weighed and placed in the veg boxes. This Friday the job fell to Penny and Anne, who tackled it with characteristic goodwill and enthusiasm. The eagerly-awaited polytunnel will house all the winter salad crops we’ve been sowing – corn salad and rocket, as well as two varieties of both mustard and mizuna. 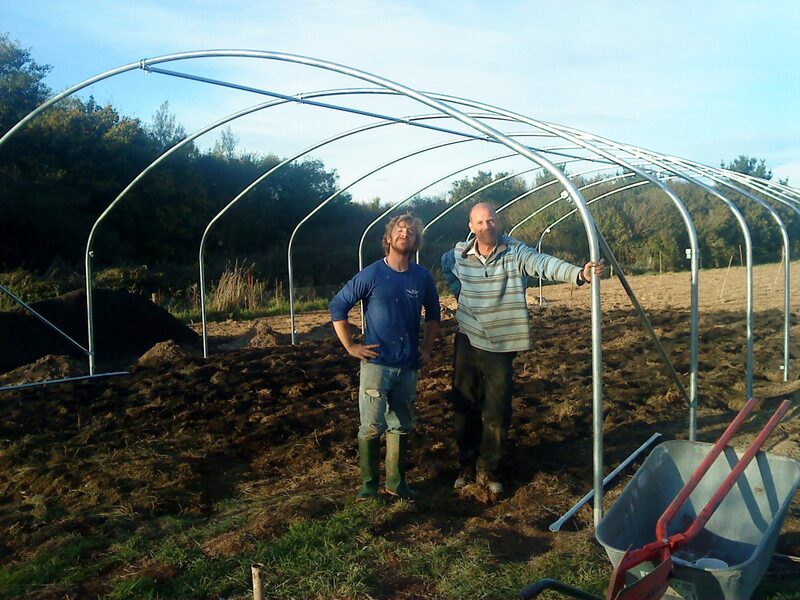 It’s the first of three big polytunnel constructions that our expert growers Jeremy and Mark N are overseeing at the far end of our two-acre site over the next 18 months. Also on our shopping list are a small seeding tunnel, cold frames, a borehole, water tank, pump, irrigation, rabbit fencing, tractor, plough, cultivator, rotovator, storage sheds and other vital horticultural equipment. 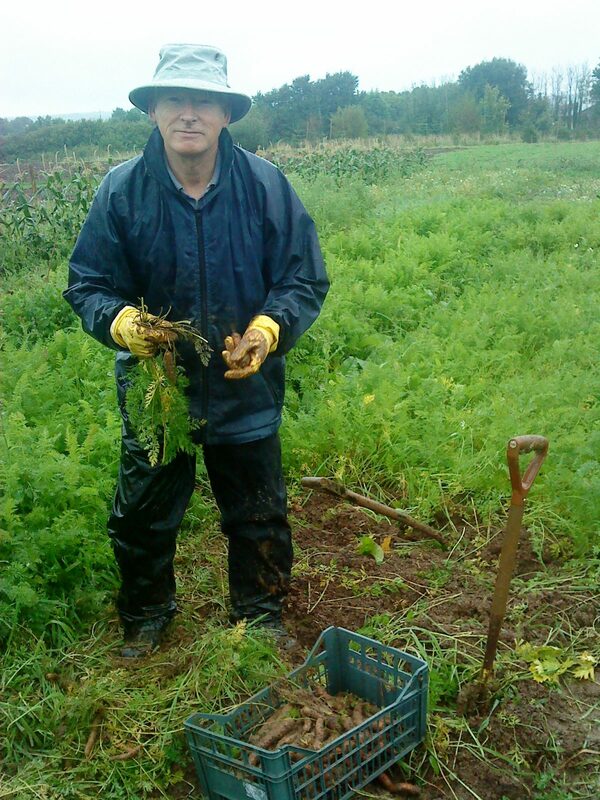 Our veg box picking and packing team got soaked through this morning as they dug carrots and harvested sweetcorn in torrential Cornish rain. 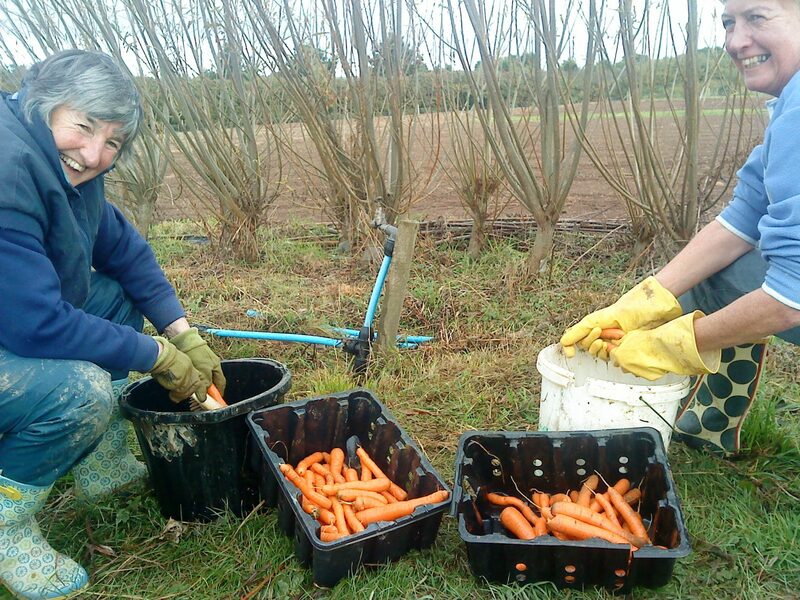 The carrots were so muddy they had to be washed by hand under the outside tap. No fun in such a steady downpour! Grateful thanks to volunteer picking and packing supremo Trish and her team – Anne, Mike S, Penny and Robert. They deserve the celebratory drink we’re all planning in the St Kew Inn tonight. The growing team has been busy sowing winter salad seed. So far we’ve planted corn salad and rocket, as well as two varieties of both mustard and mizuna. They’ll go into the new polytunnel we’re about to construct on our full two-acre site at St Kew Highway. The contents of our vegetable boxes this week come from Mark Norman, Jeremy Brown of St Kew Harvest, Benbole Farm and our own Camel CSA plot.